Are You the Next Iron Scribe? 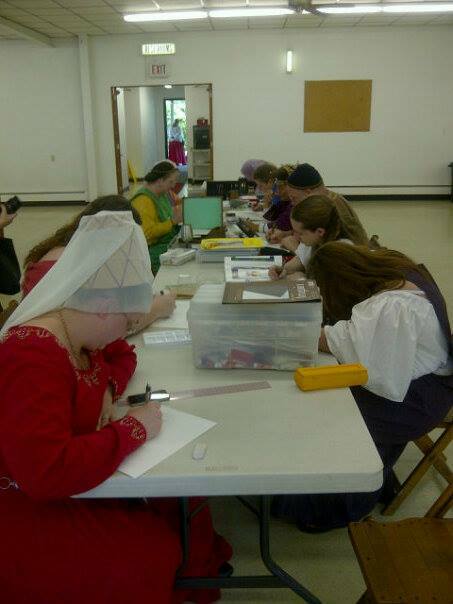 The Seventh Annual IRON SCRIBE Competition will be held at St. Swithin’s Bog Throw Back Three Day next weekend on the 18th day of July! All are invited to step into Illumination Stadium and compete for the title of IRON SCRIBE! Whether you’ve only colored in coloring books or you have your Laurel in illumination, this is the competition for you! At the start of the contest, the Mystery Theme will be revealed! You will then be given a set amount of time to create an illuminated scroll blank that embodies that theme, however you interpret it. You may feverishly work the whole time, or come and go as you please, but when the clock strikes at the end of your allotted time all brushes will be put away and the judges will then pick who will earn the title of Iron Scribe! Feel free to bring books, light boxes, paints, pens, brushes, paper*, vellum, whatever you think you may need to complete a scroll blank. You may then take your blank with you, or donate it to our faire Barony or Sylvan Kingdom as you see fit. Come and enjoy a day of competitive camaraderie as we create and draw and paint our way to glory!! *Paper will be provided but you are welcome to use your own!